Hero Histories: Fly the Yuletide Skies with--SKY WIZARD! Fly the Yuletide Skies with--SKY WIZARD! In the 1940s, superheroes were the primary genre in both comic books and pulp magazines. The skies and streets of pop fiction were filled with people in capes, cowls, leotards, or some combination thereof. And, of course, a superhero had to have a super-power or gimmick that would set him (or her) apart from the crowd. 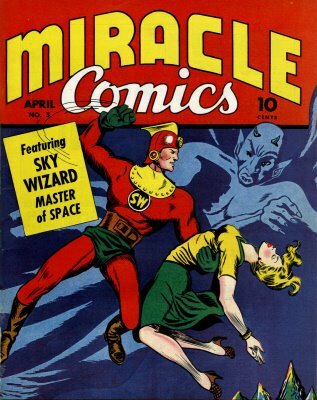 We at Atomic Kommie Comics™thought highly-enough of Sky Wizard that we added him to the Lost Heroes of the Golden Age of Comics™ lineup without hesitation! 1) He's "the Master of Space"! Catchy, eh? 3) He can't make up his mind about what costume to wear! He wore a different costume in each of his four cover appearances! With a name like that, you know we had to find a spot for him, and his book, in our kitchy lineup! So, if you're looking for a unique, Golden-Age superhero-oriented gift (shirt, mug, blank sketchbook) for your pop-culture craving sweetie, you can't go wrong with a Sky Wizard gift under the tree (or maybe above it)! I only see three costumes, the coffee mug costume, the satchel costume, the T shirt. where's the fourth? Don't you have an item to put that on? I didn't have a copy of #2 to scan a hi-res file I'd need to use on the products. Special Repost: THE GREEN HORNET vs BATMAN!